This is a guest blog by Jayne Carroll. Place-names are short texts – they can tell us all sorts of things about the people, landscape, and languages of the past. In England, most place-names are very old. Many of them were given by Anglo-Saxons as descriptive labels more than a thousand years ago. We might guess that Oxford once meant ‘river crossing used by oxen’, but we couldn’t possibly guess what Nottingham meant. It is early spellings of place-names and knowledge of the languages that were spoken when the names were given that hold the key to their meanings. If you know Old English and have spellings like Snotengaham, recorded in the Anglo-Saxon Chronicle in the entry for the year 868, then you can work out that Nottingham once meant ‘the homestead of Snot’s followers’! Place-name surveys are based upon collections of thousands of historical spellings. Volunteers have been supporting scholars in the process of collection for decades. During WW2, schoolchildren collected Cumberland field-names which were eventually published in 1952 as part of the English Place-Name Society’s Survey of that county. A team of volunteers worked on and off from the 1960s to the 1980s collecting Shropshire place-name spellings. The fruits of their labours are still appearing – volume 1 was published in 1990, volume 7 is coming out later this year (2018). 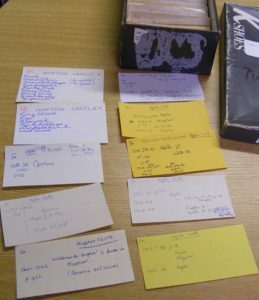 Shropshire volunteers working with the eminent place-name scholar Dr Margaret Gelling recorded historical place-name forms on slips which were then sorted into her old shoe boxes. Typically, volunteers would write down historical spellings on small slips of paper. These would be sorted (often into shoe boxes! ), analysed, and assigned to locations by place-name scholars – hours of painstaking work. Funding from the Digital Research Team to undertake an innovative project has begun to transform the way we at the Institute for Name-Studies (INS) work with volunteers. 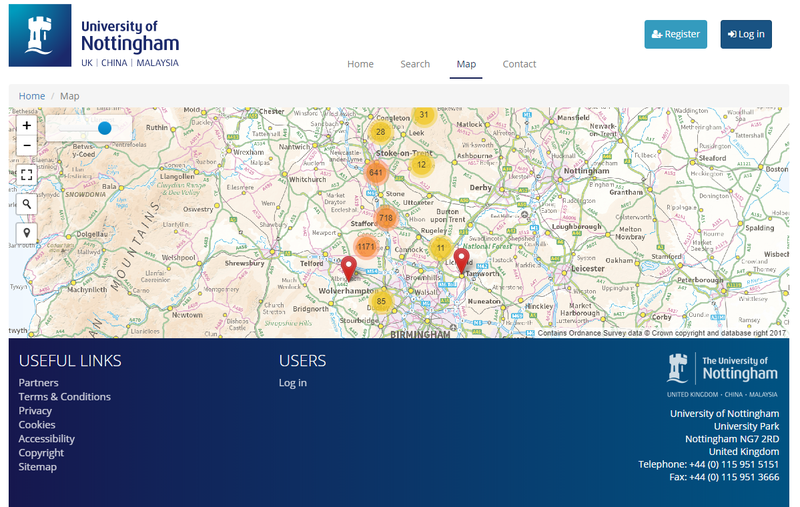 It has enabled us to work with exeGesIS Spatial Data Management to create an online system (https://staffordshireplacenames.esdm.co.uk/) for a group of volunteers in Staffordshire. Our Staffordshire group enter historical spellings, associate them with a dated source and (where possible) a modern place-name, and assign them to a location using a map interface. They can also record any helpful snippets of local knowledge which may provide clues to a name’s meaning and significance. The site combines many of the initial tasks of place-name scholarship, and provides us with fantastically reliable, structured data for analysis. It also makes the work of our volunteers freely available through a clickable map interface or by searching. In just three months, the volunteers have already managed to enter over 2,000 place-name forms into the new interface. Three field-names collected by the Staffordshire team will give a taste of the delights they are uncovering: Bluber leas (leas refers to pasture), Greate Robin Owlers (which may contain a reference to alder trees) and the intriguing Little mitedish, both from a 17th-century land survey. A further 16,000 forms, collected by the group before they had access to the new interface, will be bulk-uploaded later this year. Their work will underpin an application to the Arts and Humanities Research Council to complete a county survey of Staffordshire’s place-names. The site is now being supported with help from the British Academy – the EPNS Survey is one of around 50 Academy Research Projects “intended to offer the kitemarking of academic excellence to major long term infrastructural projects … intended to produce fundamental works of scholarship”. We hope that, in due course, the interface will be adopted by volunteers in other counties.